Cooking on an outdoor grill: What are the advantages? Cooking on an outdoor grill is the most common form of outdoor cooking. Most people have some experience with grill cooking and even own a grill which is sitting out and rusting in their backyard. So here are some of the advantages to barbecue cooking. I'm pretty sure you'll be convinced its a pretty special and fun way to prepare food. So get that grill out of storage, dust it off and start grillin'! The flavors! - Food cooked on a grill or barbecue is delicious! Why? The intense heat of the fire and the grill grate helps to caramelize the surface of your food. This brown, golden color your food gets accents and brings out the flavors of your raw ingredients. 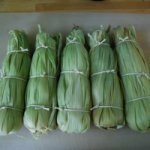 Also, when cooking on a charcoal grill or on a gas grill with a wood smoker box the wood smoke flavors imparted to the food are great. Smoker woods like mesquite and hickory add distinct and unique aromas and flavors to compliment your food. There is no real way to recreate this indoors. Sure, you can use a few drops of liquid smoke, but its just not the same as cooking on an outdoor grill with all the real wood smoke. Convenience - Charcoal and gas grills are readily available and easy to use. You can find everything from simple inexpensive grills to gigantic fancy grills with cool features. Charcoal and gas are easy to find and buy. Versatility of fuels - There are several types of grills. Charcoal grills use wood charcoal for heat while gas grills use a gas source to supply the fire and heat. Charcoal is available in a variety of types, from processed charcoal to lump wood charcoal. Flavors can also be enhanced by the addition of smoking woods like mesquite and hickory. Nowadays most grills are made in natural gas grill versions (or can be converted to natural gas) allowing you to use your natural gas line in your home, burning cheaper, cleaner and never running out of fuel. Newest on the market are infrared burners available on many gas grills. These supply super-high intense heat for fast searing and sealing in those juices! 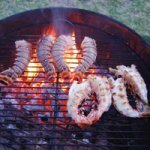 Versatility of styles of barbecue cooking - Cooking on an outdoor grill doesn't just mean trowing a burger on the grill anymore. From direct heat searing to indirect heat roast, from rotisserie cooking to smoker cooking, cooking on an outdoor grill is versatile. Find out more about styles of barbecue cooking. Versatility of recipes - Pretty much every cuisine the world round, every country, every style of cooking has recipes that can be, or should be, cooked on a grill or barbecue. From the simple to the elaborate and gourmet, there is an endless list of recipes for grill cooking. So are there any disadvantages to cooking on an outdoor grill? We'll I don't think there are any, but here are a few that some people may complain about. Its messy - Sure, barbecue cooking is outdoors, but thats part of the fun! Also, getting the grill set up and dealing with that messy, sooty charcoal and later cleaning the grill is a bit of mess. I see it as part of the fun as well, but some people might find this to be a disadvantage. It takes time - If you are in a rush to get food ready, barbecue cooking might not be the best option for you. One solution to this is a gas or natural gas grill, which is easier to start up and turn off. Charcoal takes more time to get lit and get ready for cooking. Cooking with firewood - Most grills are not made to accommodate a real firewood fire. For the outdoor cooking purist this may be seen as a disadvantage. The real die-hard fire cooking lovers will tell you that there is nothing like cooking over real firewood embers. While I agree to some extent and love fire pit grilling too, this takes even more time than cooking on an outdoor grill with charcoal. Also, with real lump wood charcoal and or wood chips for smoking you can get very similar embers and flavors as a firewood fire. This really comes down to preference. I love both! Done learning all the advantages of cooking on an outdoor grill? Return to the grill cooking page. 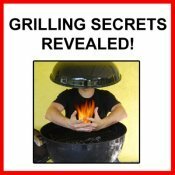 CLICK HERE to return to the Firepit and Grilling Guru home page.